The Search Count Replace (SCR) macro is particularly useful with acronyms, although it can be used with any term or phrase. SCR is found on the Highlight menu. Many times there is a requirement that an acronym be used a minimum number of times in a document or that it be spelled out instead. SCR makes it easy to determine if that requirement is met, and if it isn&apos;t, to make the appropriate change. SCR makes it easy to know whether, in the case of an acronym, it has been previously spelled out or if this is the first instance. SCR makes it easy to change an incorrect term or phrase through a document. The first step in using SCR is to select the search term. Remember that the macro will search for the complete selected term, so, for example, if you select an acronym plus its spell out, the macro will search for that combination and will not find the spell out or the acronym individually. In the following image, the acronym CINV has been selected as the find term. 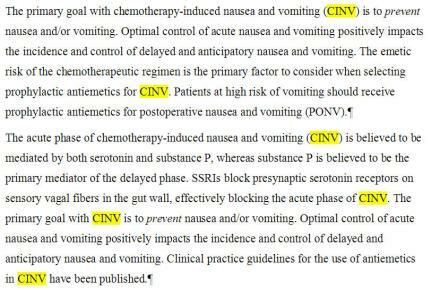 Note that in our sample text, CINV appears 6 times in the document. 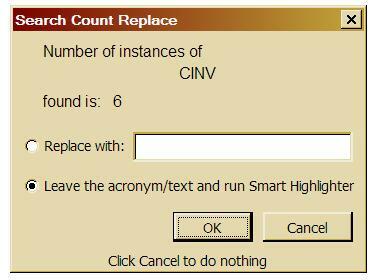 Now you have 3 choices: (1) click Cancel to do nothing; (2) replace CINV with some other text by entering the replacement text in the Replace with field and click OK; and (3) leave the acronym and run the Smart Highlighter macro so that you have a visual cue that the acronym has already been checked. 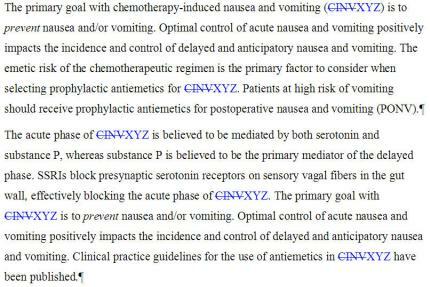 The following image shows what happens if we choose the second option and replace CINV with XYZ. Note that changes are only made with Track Changes on. The macro will automatically turn tracking on if it is off before making the replacements. This image shows what happens when the third option is chosen. The running of Smart Highlighter highlights the find term so that you have a visual clue that, in this instance, the acronym CINV has been checked. This is particularly useful in instances such as that illustrated in the first line of the second paragraph. The highlighting of CINV tells us that it has already been spelled out in the document so that we need to delete the spelled out version and the parentheses surrounding the acronym in this location. Imagine how useful SCR can be for you! wordsnSync, EditTools, and any combinations thereof are copyright 2007 - 2019 by wordsnSync Ltd and are trademarks of wordsnSync Ltd. The arrow, the wordsnSync name, and the slogan are trademarks of wordsnSync Ltd. The absence of a trademark or copyright symbol does not constitute a waiver of any intellectual property rights that wordsnSync Ltd has established in any of its products, features, service names, or logos.